GlassBlowing is a deeply peaceful dance with an amazing partner. "Hot Glass demands your complete attention. 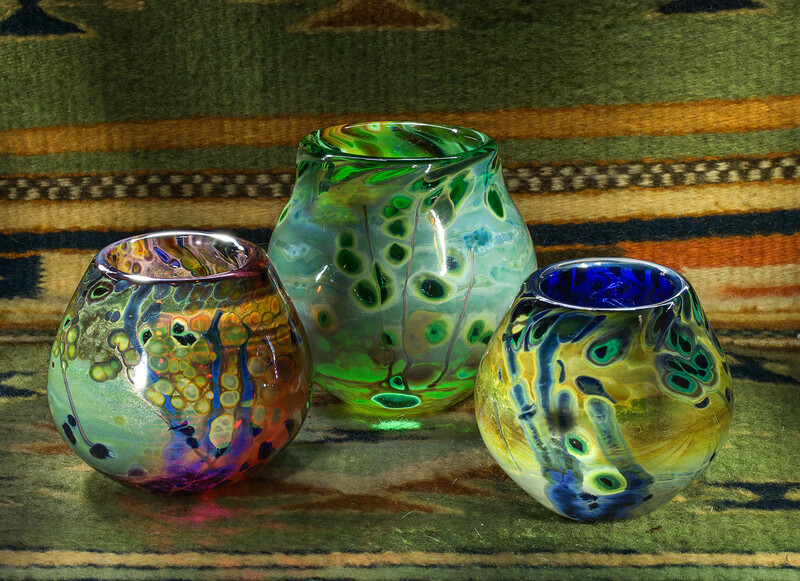 Glassblowing is a constant negotiation, a dance à deux, between a seductive flowing material with its own will and volition and an artist with a vision and intent. If you fall out of step with the dance, the Glass will follow the lure of gravity and just as likely land on the studio floor! If you stay in step, the Glass transforms from hot honey, gathered around the end of your blowpipe, to a completed vessel: a jewel for your home. For me, the art of glassblowing is a deeply peaceful dance with the glass and the flame. I work both the shape of the glass, to create the vessel, and the surface of the glass, as if it is a molten canvas. The hot glass, the 2300 degree flame, and the metals I apply to the molten glass surface all have their own chemistry … a chemistry that results in unique and extraordinary beauty."